The traditional Sabi Spartan Boxing Day Swim will once again take place at 1 pm on Wednesday 26 December in front of the statue in Sabinillas. All swimmers are welcome, and if you don’t fancy braving the waves then you can always help by sponsoring someone who is. 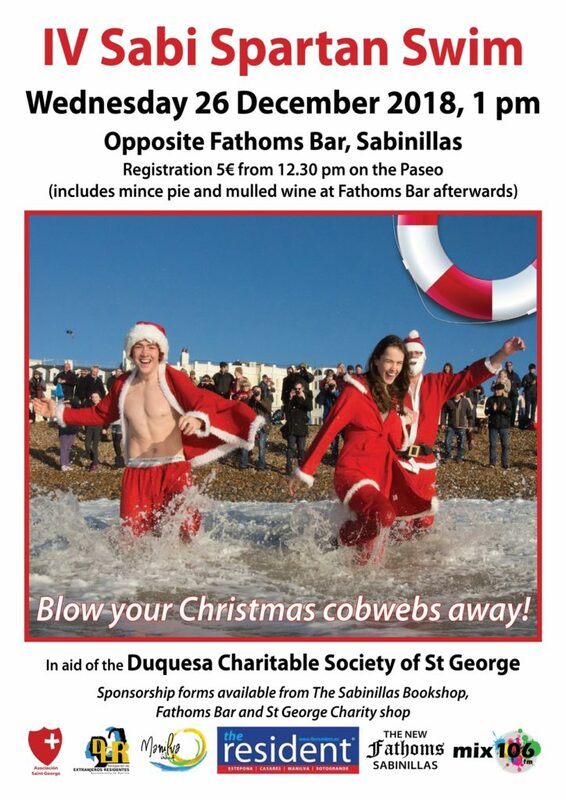 Registration opens at 12.30 pm on the Paseo de Maritimo and is 5 euros per person which includes a glass of mulled wine and a mince pie at Fathoms to warm up after the swim. All monies raised will go to The Duquesa Charitable Society of St George ‘Feed a Child Campaign’ in collaboration with the Emaus Social Kitchen in Estepona. Sponsorship forms are available from the St George Charity Shop; Fathoms; or The Bookshop in Sabinillas.